As a teen, Caitlin Fleming had walked the catwalks and graced the walls of adolescent males. As a woman, Cait had traded fashion for forensics. As a forensic anthropologist working at Raiker Forensics, Cait was a specialist in her field. She was also used to the double takes and preconceived ideas about her IQ. She was equally capable of handling an armed criminal, a decomposing body, and a bad tempered, ill mannered outdoor guide. Zach Sharper knew finding the bags of bones were going to disrupt his life. He wanted to be left alone to run his business. Now, not only had he had to answer questions, but he was "on call" to help guide Cait around as she investigated the case. Not that she needed his help much. She surprised him at every turn, but the fact that he found himself dismayed at the thought of her eventually leaving to be even more surprising. Waking the Dead was a chilling thriller that gripped my attention from the very first page. With a tad more graphic detail than I typically read in a romance, I was intrigued by the mystery, but will be hesitant before approaching a cave in the future. I enjoyed Zach and his romance with Cait. 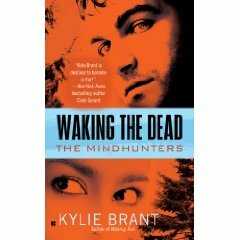 I hope that Kylie Brant will continue with more Mindhunters stories.